Acupuncture is one of the five branches of Chinese medicine and the result of 2,000 years of observation, experience and practice. It consists of finding the source of the illness as well as relieving and preventing imbalances in the body. In other words, acupuncture is used for both psychologicaland physical illnesses such as tension, pain and injury. Human beings are viewed holistically; we are considered to be a part of our external environment and therefore governed by the same rules and principles. In Chinese medicine, the body consists of more than 400 specific points which are located along 20 meridians. From those meridians and points, the « Qi » (energy), blood and body fluids (hormones, lymph) flow. During treatment, very fine, flexible needles are inserted into specific acupuncture points on the skin’s surface to produce specific physiological effects. Depending on your particular situation, acupuncture’s effects may be relaxing, stimulating, analgesic and/or anti-inflammatory. In some cases, acupuncture may be used along with other therapies. 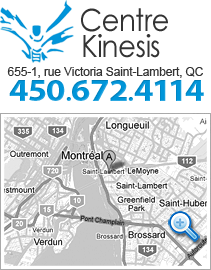 At Centre Kinesis, we only use single-use, disposable, sterilized and individually wrapped needles.